1. Preheat the oven to 220˚C, gas mark 7. Roll the pastry out on a floured surface to about 0.2cm thick. Cut out a rough circle at least 5cm wider than the top of a 20cm heavy-based, ovenproof frying pan and lay on a baking sheet. Prick the pastry all over with a fork, cover and chill in the fridge for at least 20 minutes. 2. Meanwhile, put the vanilla pod and seeds in the 20cm pan with the sugar, butter and alcohol or water. Heat gently until the sugar dissolves, then simmer briskly for 2-3 minutes to a dark, sticky toffee; take off the heat. 3. Working from the outside in, lay the apples in the pan, ensuring the flat sides touch the pan’s base and sides and that there aren’t any gaps. 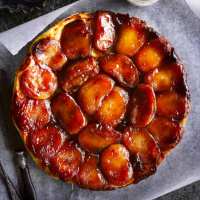 Cook over a medium-high heat for 10-15 minutes, without turning the apples, to create a thick layer of amber, almost burnt, caramel on the base. Scatter over a pinch of salt and take off the heat. 4. Lay the chilled pastry tightly over the apples, tucking any of the overhang down the sides of the pan with a wooden spoon. Cut a few slits in the pastry to let steam escape, then bake for 20 minutes. Reduce the oven temperature to 200˚C, gas mark 6 and cook for 10-15 minutes more, then set aside to rest for a final 10 minutes. 5. Take a plate that is larger than the pan. Hold it upside down over the top of the pan and quickly flip over to turn out the tarte. Serve with vanilla ice cream or crème fraîche, if liked.